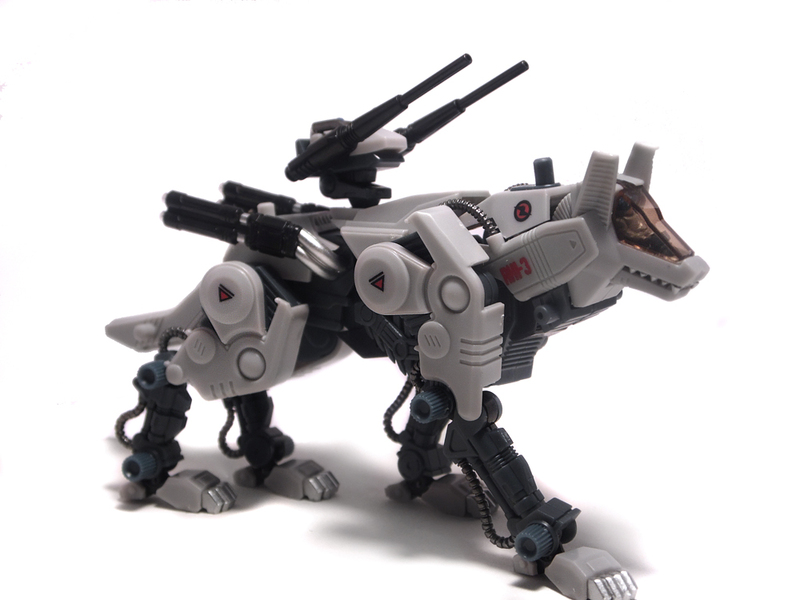 The MSS Command Wolf is a sleek, well articulated Zoid. It shares a lot of aesthetic design with the original, but with longer forelimbs and a lower jaw that jutts out a bit more. The color is a gray, actually pretty dark and not at all white-ish as seen in online photos. This photo is a good example. Design wise the Zoid is sound. There aren't any parts that come off easily. The turret on the back is noticeably changed to a roll cage instead of a glass canopy like before. The thin legs are easy to move but unfortunately he has trouble standing up sometimes, and his small feet mean he tips over a lot. Aside from the tipping problem the Command Wolf has excellent range of motion, and thanks to its thin legs they can tilt far inwards. This lets Command Wolf walk a straight line, with one paw almost directly in front of the other. Unfortunately the pipes and teeth are extremely fragile. I managed to break one pipe and one of the fangs even trying to be careful. Command Wolf also comes with an added diaroma base, the first one with grass! All MSS kits come with two rubber rectangular pieces that, as seen in the last photo are used to attach one diaroma base to another. A high maneuverability for local conflict | Combat beast machine "Command Wolf"
A land high-speed attack mecha developed in order to oppose the high-speed mechanized Saber Tiger units commanded by the Imperial army. It's possible to detach the double-barrled beam gun platform from its back from the main body and use it as a unique flying attack vehicle; after the gun platform is detached it performs support in combat and gathers information from the air. *Data based on the original setup. More importance was placed on strengthening the armaments than speed for forest combat; the lower part of the fuselage was newely equipped with a high-speed cannon gun and the shoulders have small missile pods. It performs long distance sniping at night. It's equipped with a powerful cannon gun that destroys enemies in one shot, but it carries few shells. That's why importance was placed on lowering its detection rate and its body is painted black, and countermeasures like a built-in infra-redray control unit in the engine exhaust ports. The canopy of Command Wolf is printed in the original brown color of the OJR release. It flips open but the control stick doesn't move like prior releases. He comes with a small painted pilot. Command Wolf has a horrible underbite, which is a lot more obvious than other kits. His teth are also very fragile and easy to break when pressing into the upper parts. The head rotates up and down but is stopped by the plastic on the bottom of the neck. Still a pretty good range of motion! The neck rotates up and down a decent amount, and the assembly of the neck and head allows a slight side-to-side motion. While the front leg has a good range of motion it also almost looks broken, with how far back it can move! Either way this is pretty convenient for poses where the legs stretch out. The front legs can fold very far inwards and outwards, much more than most other posable kits. The rear legs also move forwards and back, but unlike other posable Command Wolves only two parts are articulated, with the mid section being a solid piece with the upper leg. The back legs have a much smaller range of outwards motion than the front legs do. The body as one main point of articulation right behind the ribs, where it can bend up and down. The hip also bends left and right. Not only can the tail swing left, right, and move up and down, but the ball joint allows it to twist at an angle. The gun on the back no longer has a transparent canopy, likely because of the size of the pilots. Instead a roll cage has been added to hold the pilot in. Both barels rotate up and down seperately. The gun swivels 360 at the base, where it connects to the back, and a bar between the back and the gun allows some up and down motion. Just like the motorized kit the Command Wolf has lots of pegs for additional weapons to be added. The difference is that pegs like the neck one are actually able to hold the gun now. There is a peg on either side of the neck, the top, both sides of the tail, the upper back, and the lower back. The first image shows him loaded up with some weapons from the Sabre Tiger!